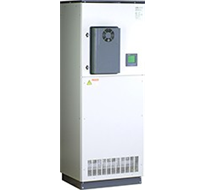 A superior cost-effective alternative to electro-mechanical power factor correction banks. Acivar offers fast compensation, unlimited number of transient free operations and a unique self-testing and comprehensive reporting feature. Fast & Transient-Free switching. Fast Compensation (1 second typical, 3-4 seconds maximum), unlimited number of operations and transient-free. Low-cost solution for replacing electro-mechanical Power Factor solutions. Prevents danmage to sensive equipment. Saves Energy. Harmonic Filtration. Accurate power factor control even with harmonics present. Extremely long life expectancy. Considerably low temperature rises, due to unique scan mode. Integral power quality analyzer. Unique self-testing and comprehensive reporting feature. Easy upgrade to the Equalizer. Elspec's systems switch capacitor groups on and off using state-of-the-art electronic switches (full compensation in less than 2/3 of a cycle). The connection and disconnection of capacitors occur precisely at zero-current crossing. This smooth connection avoids transient effects typically created by electromechanically switched power factor correction (PFC) systems, extending the life expectancy of the EQUALIZER dramatically. The controller uses FFT (Fast Fourier Transform) analysis of all phases each cycle. Power information, system status and detailed logs of events are displayed on a large backlit graphic LCD screen, or via communication using the user-friendly PowerIQ software. Using exclusive automatic control algorithms and rapid electronic switching, total acquisition time (complete compensation of reactive current) is achieved in 2/3 cycle typical (50Hz = 13.3 ms; 60Hz = 11.1 ms), irrespective of the number of steps required. The power factor is controlled very accurately through an advanced open and closed-loop control & measuring system that uses information from all three phases, as well as accounts for the effect of harmonics (1 through 63). Minimum, maximum and average power factor modes, as well as threshold levels, can be selected for perfect compliance with specific network requirements. The EQUALIZER includes a unique solution for line-to-line loads, in which it calculates a transformer’s internal currents and compensates accordingly. Third party measurements have proven the EQUALIZER to be the ultimate solution to offer precise compensation for voltage drop and flickering. The EQUALIZER is equipped with a unique SCAN feature that protects capacitors from exploding and contributes to longer life expectancy by reducing over-current and minimizing capacitor heating. The electronic switching element (unlimited operations) connects one capacitor group simultaneously as another group is disconnected. This operation occurs every few seconds, engaging each capacitor group in turn, with total compensation unchanged. This results in mean current reduction due to lower duty cycle (engagement time to cycle time). Together with the unique reactor design, temperature rise of the reactors is substantially reduced and the potential for cabinet overheating is minimized. Conventional electromechanical capacitor banks suffer from an ongoing cumulative reduction in capacity due to the effect of transients during connection and disconnection. This can be especially detrimental in tuned and detuned electromechanically switched systems where changes in the ratio between the capacitors and reactors shift the resonant frequency. This scenario can cause resonance, which can cause extreme damage to equipment in the facility. The EQUALIZER prevents this scenario, resulting in longer system life, lower maintenance costs and more consistent harmonic filtration over time. Elspec Activar is a cost effective alternative to electro-mechanical power factor correction banks. Capable of delivering compensation at a rate of 1 second or typically 3-4 seconds maximum, the Activar can deliver an unlimited number of transient free operations, is a low cost replacement for electro-mechanical power factor solutions and is equipped with a comprehensive reporting system.